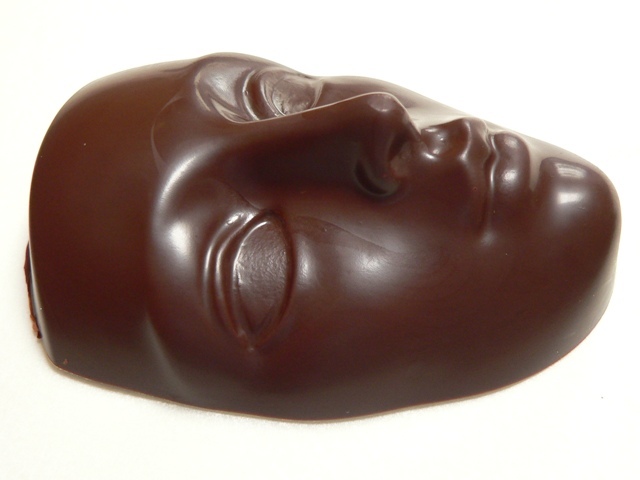 Inspired by this post at Some Say Cacao, I added a mask mould to my last order from Candyland Crafts. Each mask was 11cm long and beautifully detailed. A boxed set of three made the perfect birthday present for my friend Julie. 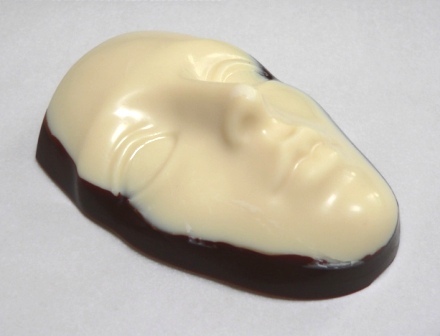 I ended up with an excess of white chocolate, which I moulded into a white and dark chocolate mask. It came out looking like carved marble! Gillian at Some Say Cocoa – my virtual chocolate fix – blogged about ginger chocolate recently. I’m so suggestible (don’t you love that word? Alex taught it to me..), that I had to go straight out and buy ginger from the supermarket to make my own. Buderim Ginger make some of the finest in the world, and this is one of their newer products – a glace ginger without the added sugar coating. It’s still sweet, but without being overly so, and a little too easy to eat straight from the packet. I dipped a few pieces at a time into a small bowl of tempered dark chocolate, which was resting on a heat mat to keep it at 88°C. 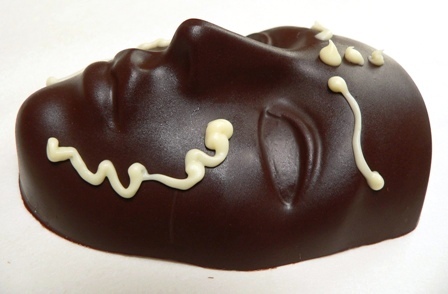 The chocolate was a mix of Callebaut 54% and 70%, to counter the sweetness of the ginger. Perhaps the best thing about making ginger chocolate is that not everyone likes it. All the more for those of us who do! …can turn a boring butter cookie into a festive treat? David Lebovitz has done for chocolate what Bruce Lee did for kung fu – he has demystified a formerly secretive art and made it accessible to the general public. Ok, so I never managed to learn kung fu (take that sad image out of your minds right now), but I have learnt to do clever things with chocolate. And like the Dragon, in Lebovitz’ case, it’s all about technique. His recipes aren’t overly complicated, but their success or failure depends entirely on execution. A wonderful case in point is the recipe for hot chocolate in his new book The Sweet Life in Paris (which is a great read, despite its mildly-annoying-but-very-French deckle cut finish). It’s a simple recipe; just milk, chocolate and a pinch of salt. However, made correctly, it is creamy, smooth and delicious – we’ve grown quite addicted to it as a restorative tonic and now keep a small bottle in the fridge at all times for emergencies. Last night, I whipped up a batch of Lebovitz’ dark chocolate biscotti. The original recipe is on his blog and I was planning to reproduce it here, until I realised that I really couldn’t explain the methodology any better than he has. For what it’s worth, I used Callebaut dutch cocoa in mine, which resulted in an extra dark cookie. They’re very grown up, yet oddly reminiscent of the politically incorrect Golliwog biscuits of my childhood – while completely different in shape and form, the flavour jogs something in the recesses of my brain (I think it’s the crispness combined with the cocoa). Some of the biscotti were treated to a coating of tempered chocolate, which made them ridiculously moreish, particularly with a hot cup of tea.